I have another new dress to share! It's for the Dolly Clackett sewalong Roisin makes beautiful dresses and the sewalong is to celebrate her upcoming wedding by making dresses in her style. This is from Mc'Call's 6859, a vintage pattern from 1963. I really like how it turned out. It looks a little wrinkly in the picture because Khloe was in a hurry to get done - it got rather chilly while we were out. It fits great and I got several compliments while we were out. The fabric is from Wal-Mart. It's a light weight cotton. 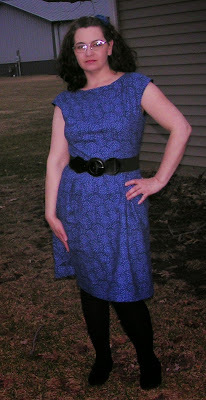 I lined the top with fabric that I cut off of a too-long slip. It was the first time I lined something that didn't call for it and I did pretty good. It has a zipper up the back and I used the instructions on the zipper package to sew a lapped zip instead of my usual visible style. That's all for today. I have another dress about half done and will be sharing it soon.